I come to this tale rather late in the day, its my final 40 out of however many there are currently listed as the “LIST”. For some it is as quick as you can do them, some by bike, some all on foot, some just in winter, some as young as you can be, for me however it has been a lifetimes journey started some 30 years ago. There are many reasons for starting but mine was just for the enjoyment of walking in a wild environment. I do not generally set out to do a hill just for the “tick”, I like to have a view from the top, this gives me a sense of its place within the country. It does not make me a fair weather walker as the majority of my hills have been done in winter, albeit on nice sunny/snowy days. 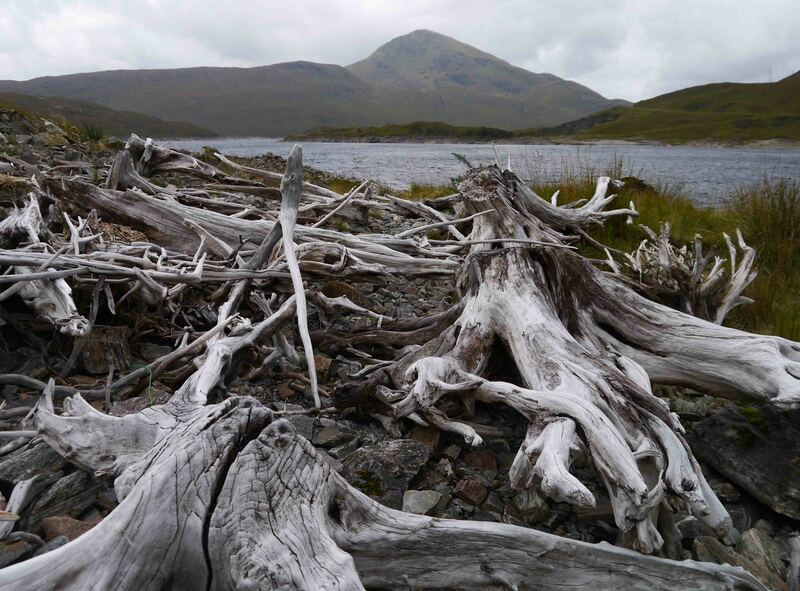 My main raison d’être is to know Scotland through the process, to visit its wildest and most remote places, to lug a tent and sleeping bag into a place which is as far away from a road as you can probably get in the UK. Doing this on my own or with family or friends, each experience as different but as rewarding as the previous. Since moving to England my rate of ticks had dropped alarmingly, no surprise there I guess, however every so often I am driven to make the journey north, to seek some real isolation and feed the hungry rat within my soul that requires this “fix” Post referendum seemed like a great time to do so, not sure why, just thought it would be good to see what effect, if any, the singly most divisive issue that Scotland had gone through for many a year had had. Jane and I set out from a lovely Indian summer sunshiney day in Somerset to drive to Kilmarnock. Kilmarnock?, well due to the Ryder cup and all the Travelodges and decent BnB’s within 50 miles of Gleneagles having trebled their prices it was the nearest and cheapest we could find. Normally I would not seek such levels of refinement ( oxymoronic when used in the same sentence as Travelodge ) but for many reasons not worth mentioning it had to be the case this time. Kilmarnock, well I guess someone has to live there, why they would choose to do so I cannot say, the best thing I can find to say about it is that it has pavements, the rest best left at that. Next morning I dropped Jane off in Crieff as she was spending some time visiting family and I headed off to tick some hills. The 40 I still have left include the most southerly, the most northerly, the highest ( No I have still not been on the summit of the Ben ) The most remote and probably the wildest. I chose to start with one that I had never gotten around to and one that I had baled off of on a foul winters day. My trusty Munro book advised that they could both be done in one day so I set out to do so. 27K and 1500m of ascent later I knew this was true but what it didn’t mention in my book was how sore doing it was going to be on the knees. 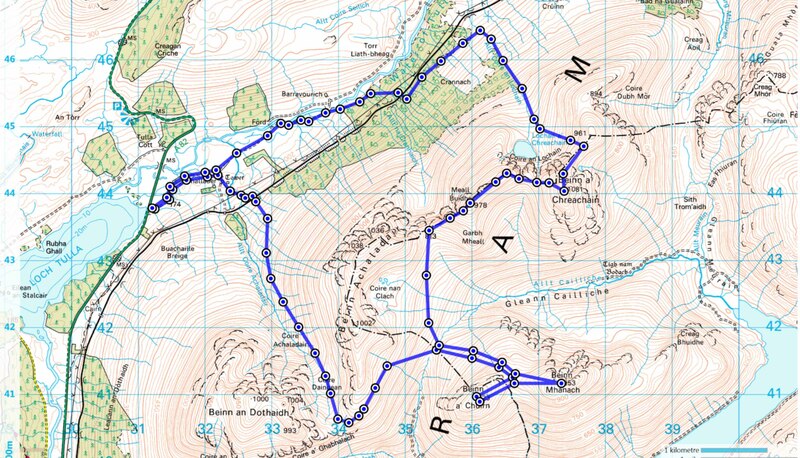 The vast majority of the route mapped out above was over rough ground with little or no paths, the exception being the actual ridge and descent from Beinn a’Chreachan. Twas a great day out, not a soul in sight, rainbows sprung into life and then disappeared as if some vast celestial hand had just wiped them away, the wind on the tops was so strong I had to crawl to my last summit of the day, it was gone 7 in the evening before I got back to the car at Achallader. I hoofed it over Rannoch and down into Glen Etive, found a space on which to put up the tent ( in the dark and in a gale ) just before the heavens opened, perfect timing, I sank into my downy world well fed and contented and listened to the rain battering down for about 30 seconds before I was out. I breakfasted leisurely and then set out for the summit of Sgurr a Mhaoraich which sits on the opposite side of the loch from Gairich. The “Book” gives an ascent time of 2hr 40. I was up it in 1hr 50. The sun added wings to my heels, I felt good to be alive, the views were outstanding, my soul was being recharged as if I was in some way tapped into an unseen energy grid. If I could bottle that and sell it I would be rich beyond my wildest dreams, which is not that hard to imagine as my dreams of wealth are not that great. I got to the summit just as the day started to turn, the clouds were darkening and lowering the light on the hills to the north was awesome. I continued over onto Am Bathaich in increasingly poor visibility and rain to drop eventually down to Alltbeithe. I returned to the car on the side of the loch to be greeted by bright warm sunshine spilling through the clouds. A dook in the loch to wash the sweat away, a warm meal and a retreat to the sleeping bag was an excellent way in which to finish my three days of feeding the rat. But what of the referendum, what effect did I see, well aside from a few faded YES signs on the roadside furniture, nothing, it was as if it hadn’t really happened. The lad I asked in the garage about it just said ” Glad its all finished with, just a distraction” My thoughts for what they are worth came to me whilst I was in the “rough bounds”. Governance is a people thing, its about money and power and political views. None of it makes any real difference to the stags and the hills, they will be there once we have all come and gone climatic disasters aside. A lot of hot air spoken, a lot of money and energy spent and all for what ? 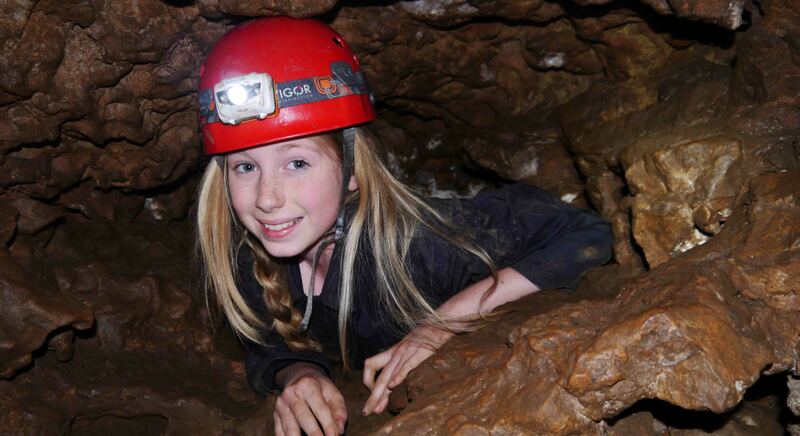 Ardingly Activity Week in Wales ( and England ) 16th June 2014. Looking awfully clean all considered. From a lovely private campsite ( with the compliments of one of our marvellous Welsh farmer friends ) near Hay on Wye we set out to push these guys through a series of challenging activities designed to stretch their comfort zones and make them aware just what they were capable of. 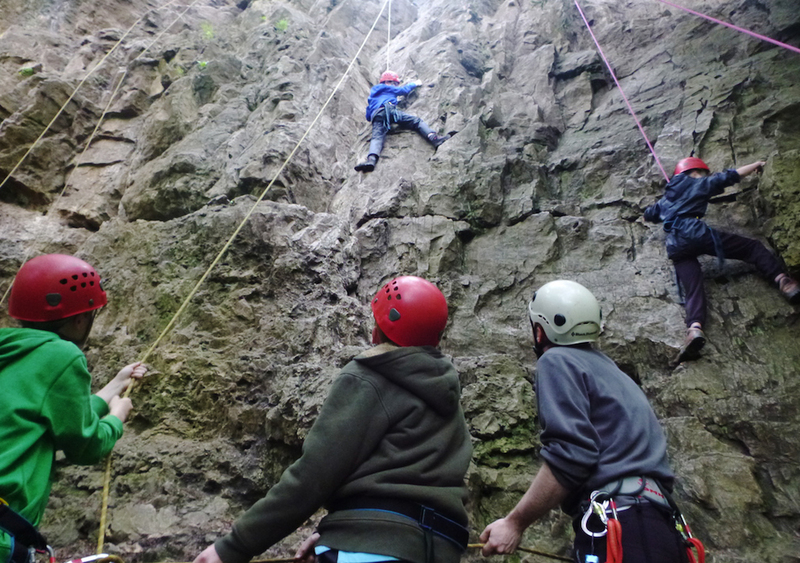 The 40 pupils were split into 4 separate activity groups and each group took a turn ( once they had bought their food and established the camp on Monday ) at Climbing and Abseiling and Caving in Symonds Yat, shelter building to provide a nights accommodation in the Welsh countryside and fish gutting to provide a substantial meal. Then it was up and over the Tampa or more entertainingly called Lord Herefords Knob. The week started warm, overcast and muggy with overnight rain giving the climbers a slippery challenge. This however was superbly managed by the mighty Noggin the Nog of Climb Pembroke fame and our very own Choire providing all the safety, Jane and myself meanwhile were taking our group deep into the subterranean passages that worm their way through the Symonds Yat limestone. Its quite a series of challenges climbing and throwing yourself off a cliff in the morning and then crawling through tight subterranean passages in the afternoon. The groups returned tired by on quite a high that evening. Meanwhile, back at the ranch, Darren, Sarah, Simon and Phil had been building shelters, well they hadn’t, in order to provide a nights accommodation. Fish cleaned and cooked in tin foil on a lovely wood fire the groups retired for the night and even a shower of rain in the early hours did not dampen their enthusiasm. Day three was a repeat of day two with the groups swapping activities but with the sun riding high in the sky, not that I saw it buried in the caves. Day four the groups set out to conquer Lord Herefords Knob. It was a hot day ( 24degrees ) under a cerulean blue sky but all of the teams made the summit and all of the members of every team showing just what these guys are made of. That night we sat around the campsite fire as the sun set and a perfect full moon rose above the Knob saluting our success. The full moon rises over the Tampa. A great week with a great bunch from a great school. We (Choire, Jane and myself) had been watching the forecast quite closely in the run up to this weekend. 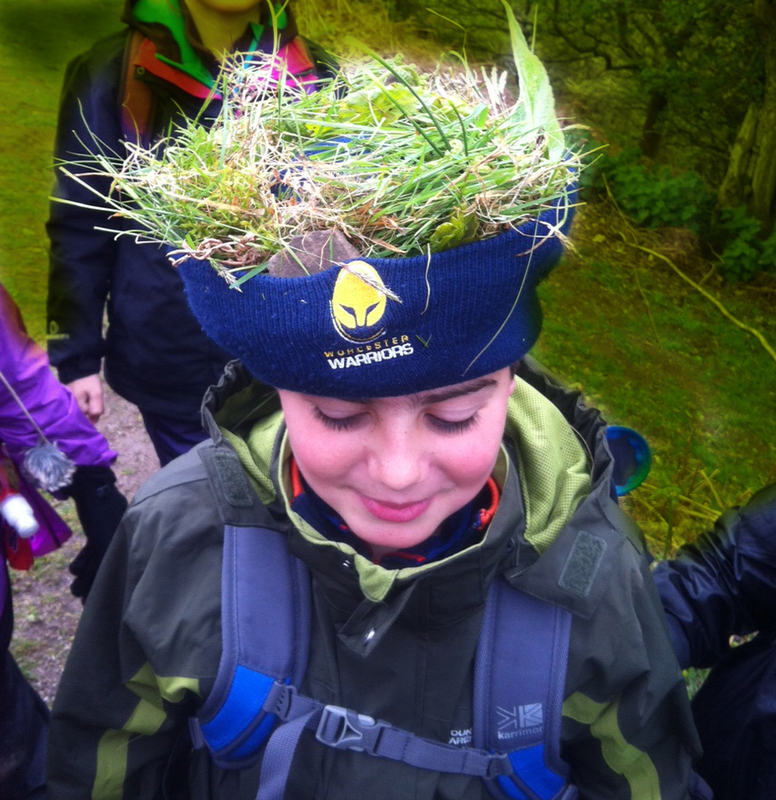 34 nine and ten year olds from Hereford Cathedral School were joining us in Llangattock campsite for an adventurous walking weekend. 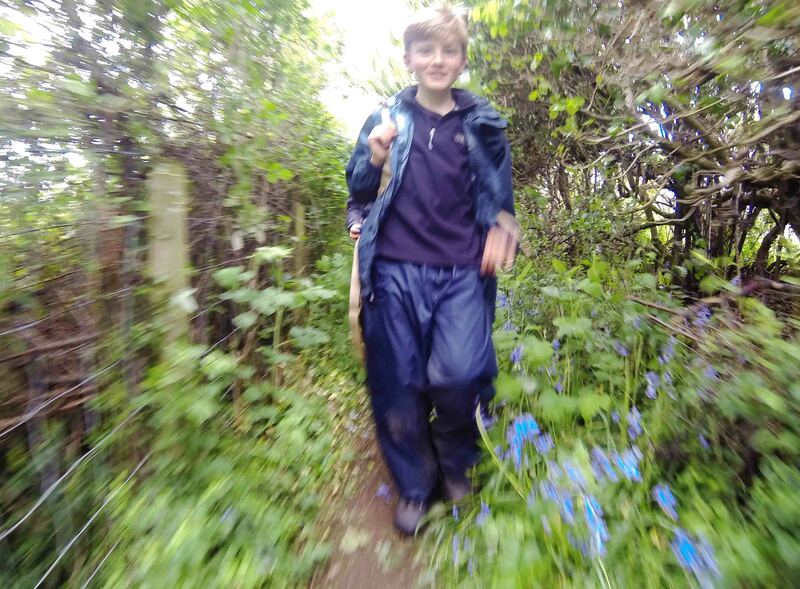 Earlier in the year we took over a few contracts from another company who had specialised in this type of activity with younger children and, apart from Jane, this was our first foray into this age-group territory. The forecast for Saturday was not brilliant so we decided to go over on Friday afternoon to pitch tents (all 20 of them) to ensure that these guys had a dry bed at least. Five hours of threading poles, pushing in pegs, fastening inners and tightening guy ropes we had established a tent city, so we retreated to the pub with bruised hands and aching backs for a pint and a pie (of sorts). 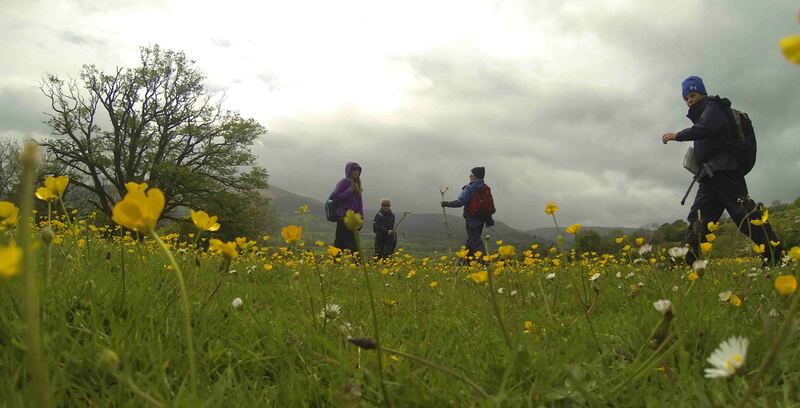 A brisk wind brought tent-shaking squally showers during the night and these continued into the morning to greet the 34 pupils as they arrived in dribs and drabs accompanied by parents whose degree of concern was probably in direct relation to the conditions which greeted them when they opened their car doors. By this time Phil, Graeme and Brett had arrived to help manage the programme of weekend walking. 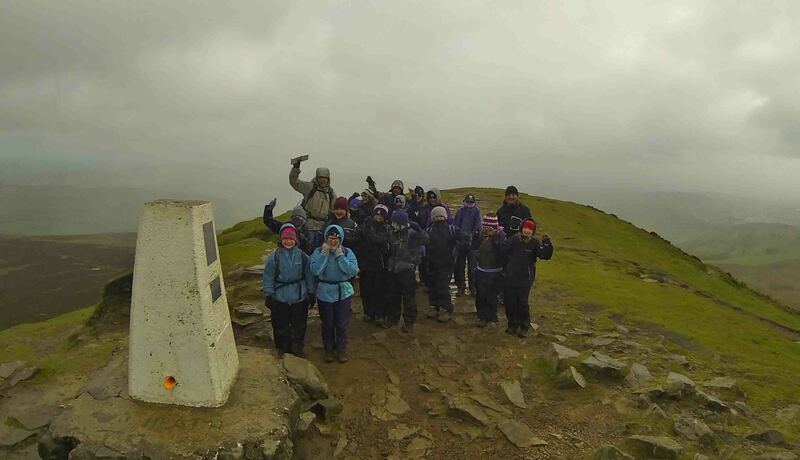 Numbers and waterproofing checked we split the gaggle into four equally sized groups and took the two year six groups over to Talybont Reservoir to start the walk back to Llangattock. Nothing too adventurous on day one, a relatively low level and straight forward walk along the canal then up and through some of the rural land which the once important means of transporting iron and coal passed through. The weather however continued to deteriorate; the wind strengthened and the rain showers became more insistent. By the time the groups arrived back at the camp it was pretty foul. Meals cooked, tummies full and hot chocolate warmed; with dry clothes taken on board, we all retreated to tents. I lay in my fairly indestructible top of the range nylon palace worrying whether or not our large mess tent and event shelter were going to be there in the morning. Jane was up at least three times during the night to check everyones’ guy ropes etc etc. My tent slapped me in the face every five mins or so as the wild wind demons whirled and warding off sleep whilst bringing to mind other nights spent high and wakeful in the mountains in adverse conditions. This time however I had 34, 9 and 10 year olds in my direct care. I should not have worried, they emerged from their tents, somewhat earlier than anticipated mind you, in fine spirits. I am sure the wilder it was the more they enjoyed it. Breakfast partaken (these guys did not really like my porridge) the groups headed off to “have a bash” at Sugarloaf. The wind continued to drop and the sun came out (albeit sporadically) and contrary to my expectations all the groups made it to the top of the hill, in pretty good times as well. 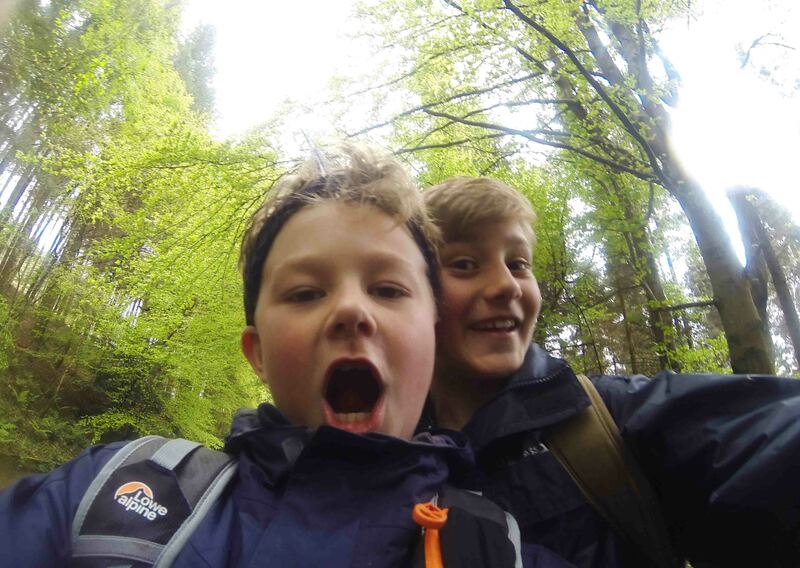 There were huge grins all round as the groups arrived down at the Lamb and Flag pub to be picked up by their parents who were amazed at what they had accomplished. I must admit that I was a tad thoughtful prior to this expedition, but I now realise that the worries were mine, these guys were there for an adventure and that’s what they got. The more the wind blew their tents around, the more they enjoyed it. They were superbly kitted out, thanks to their parents, and were prepared to survive all that the elements could discharge. 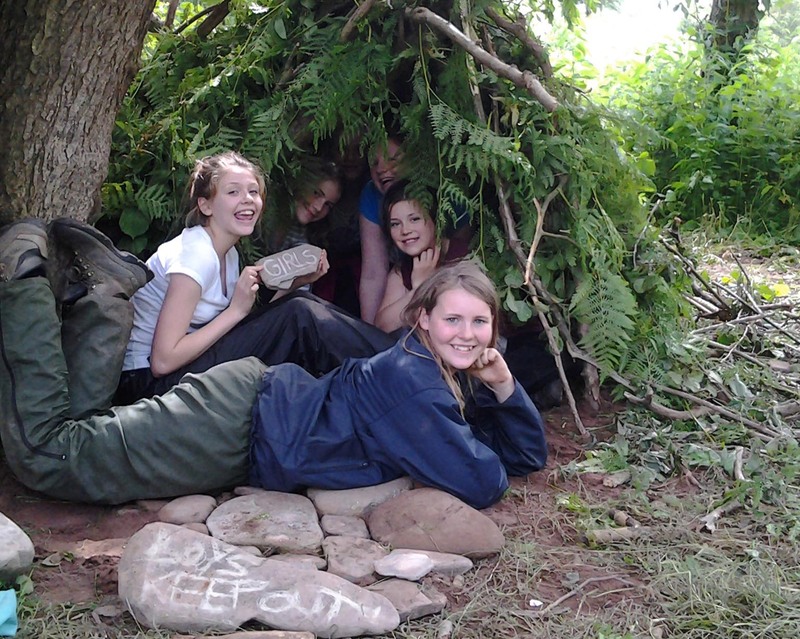 I have seen more tears and stress in the Gold DofE groups we manage. Are we worried about doing this again? Absolutely not ~ we are looking forward to it! 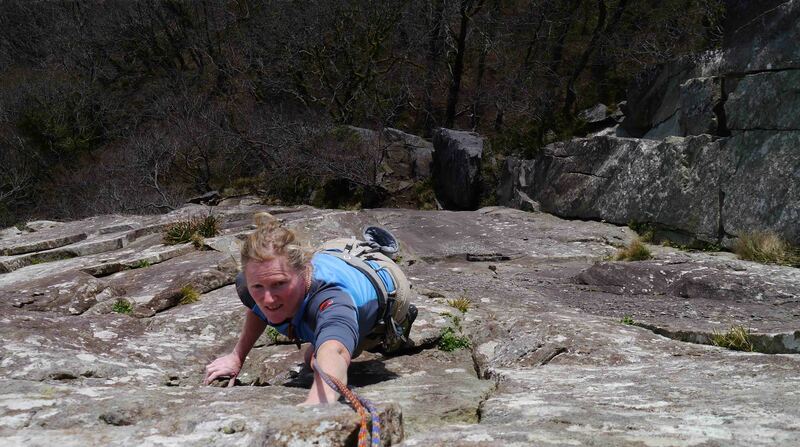 Jane reaches for a hold at the top of pitch three. I looked up at the 700ft or so of icy gully rising above me to a steep snowy headwall below the early morning cerulean blue of the Welsh sky. The air was cold on the back of my throat as my laboured breathing fought to supply my lungs with enough oxygen to placate my pumping heart. My first night in 2014 under nylon had brought me here via an 0530 rise to the bottom of Parsley Fern gully. Given grade 1/2 in ideal conditions I could see that the bottom of it was rough with the frozen remains of avalanche debris and that at at least one point the snow ran out and there was a rocky step to meet the continuation of the white stuff. Time to get on with it and not worry too much, “lets go up and have a look” I said to myself. At about a third of the way up the gully tightened between two rocky buttresses and steepened to a degree that brought me onto my front points. The snow was ideal however, my front points leaving very little trace of my having been there at all. I reached the top of this section and made a couple of heart stopping moves over steep rocks to meet the continuing neve. Taking a curving line which kept me in the shade of the rising sun I made the top of the gully just below the headwall. 10m or so of 60/70 degree icy snow lay between me and the top. Probably a wee bit steeper than usual due to the large cornices that had been there a week or so earlier. Nothing in the grand scheme of things but the 600ft of gully and rocks below me brought a focus to my axe and crampon placements. The snow had a thin layer of ice over it from a few days of freeze thaw, it made a very satisfying sound as my axes bit giving solace to my fear. Kick, push, kick, push my head came over the top and into the biting wind and the early morning sun. I pulled over the top and yelled my triumph to no-one but those creatures that inhabit the wind. They took it and carried it away over Llanberis, Holyhead mountain and into the Atlantic beyond. God I felt alive, my first real day out in the mountains of the UK and what a start, perfect neve under a lovely blue sky with only the calls of the Ravens around me. Down to the CC hut and I was breakfasting on Coffee and Porridge by 1030. Next day, after a leisurely breakfast Jane and I went down to Tremadog, the willow warblers tinkling calls were like waterfalls of sound in the trees around us as we geared up at the bottom of a three pitch route called scratch, nothing too difficult, just a nice three pitch VS to ease us back into the way of things. Fortunately we had had the foresight to pack shorts and lightweight t.shirts. It was the 12th March and spring had indeed sprung. The sun was warm, the Jackdaws were wheeling about us celebrating the joy of nest building and the trees had that hint of green about them that tells tales of summers long past, but about to come again. 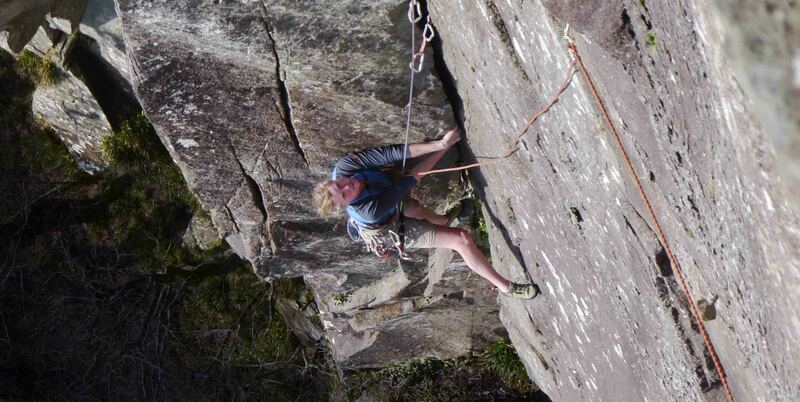 Three pitches were not enough so we abbed off and did the two pitch scratch arete to finish the day off. The setting sun chased us back to the CC hut with our bottle of white wine bound for the chilling section of the fridge while our evening meal heated up on the cooker. The next morning dawned still and breathless, it was if the National Park was holding its breath in disbelief at the weather of the last few days. The Snowdon horseshoe lay reflected in the Llyn as we made our way past Capel Curig and around to the eastern side of the Carneddi. Having been cooped up in the office since we got back from Thailand dealing with work and hiding from the really awful weather we needed a day of open spaces with the wind in our faces. Thats exactly what we got and in shorts and t.shirts again. On the far side of these hills and away from the Snowdon honeypot we had a wide open world under a big blue sky all to ourselves. Jane reaches the main ridge below Drum. The Holy Trinity: Rock Climbing, Winter Climbing and Hill Walking all in perfect conditions and on consecutive days. What more can I say. Brilliant few days, Chris. That’s what it’s really all about.